this week, i have been leaning into rest. i have been reading (just for fun) and working in bed while she naps and even napping once or twice. jon and i went on an impromptu valentine's day date (the babysitter had come over so i could work, but instead jon picked me up and we had an early dinner...it felt like breaking the rules in the best of ways). i have been trying to get to bed earlier. and i've been trying to observe myself with a more compassionate focus. i am noticing that life feels softer when i rest more. i feel softer. i am more likely to move through my day with kindness and love (toward myself, toward others). it seems so obvious but it simply is hard for me to remember some days (and weeks it seems). tonight, i am thinking about how the remembering feels like a dance of getting to know myself again and again. and i choose to see this as a beautiful gift i give myself. because there will be days full of overwhelm and misunderstandings and forgotten deadlines and unexpected bumps in the road. but i will keep reaching for compassion, and i will try to remember that rest is so often the answer. 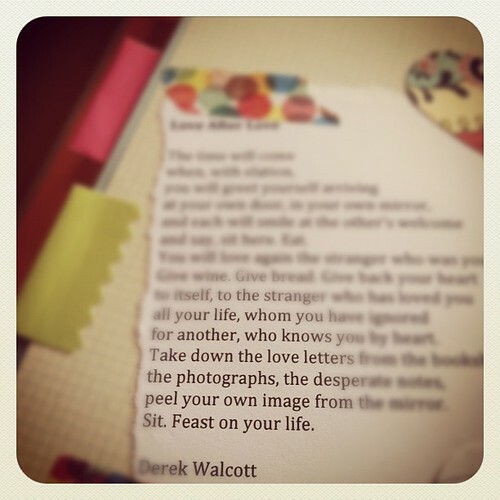 the poem that is pasted into my journal in the photo above is "love after love" by derek walcott. it is about remembering yourself. i keep it in constant rotation over here. i invite you to add it to your self-care toolbox. you can read all of this poem over here.